Displaying 12 of 188 items. Autograph Succulents features a wide variety of use as individual plants, on tabletop, massed in planter beds or as top dressing under large specimens, they look and feel like the real thing. Available in various mix of colors. 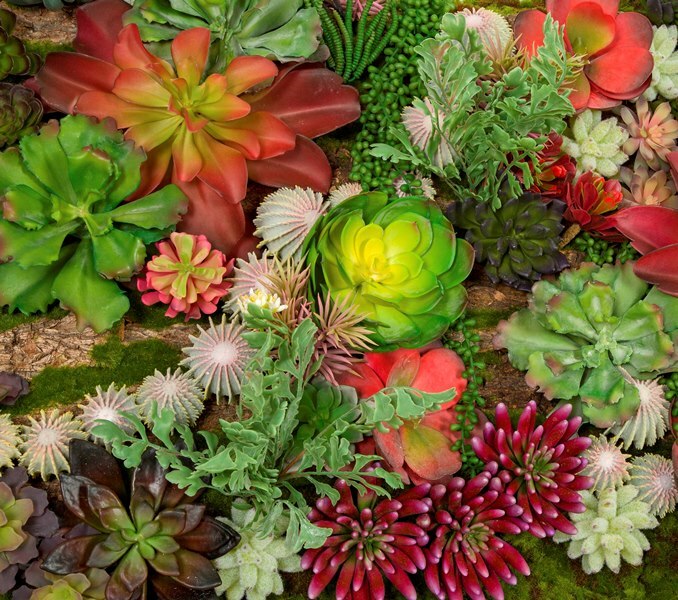 Check out our Succulent picks - Agave, Sedum, Echeveria, Money Plant, Aloe, and Aeonium and others. Check out Fire Retardant Succulents too! With the advent of Green Walls and Framed Foliage, Succulents fill a new role in your designs; for instance they can be placed geometrically in rows, or squares, mixed with other Replica plants, used as hanging balls, or done as stripes. You can even spell out names or logos. Using Succulents is an eye-catcher and we all know that something relatively small but unique can be the one thing that intrigues the client. In Lobby, over the Reception Desk, or on the Restaurant Wall, they will find a home. And, because they are Replica, they go anywhere!